Are you looking into where to find school uniforms in Albany, NY for your children? B. Lodge is the place to go! 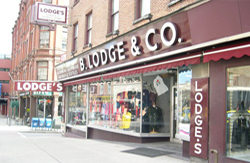 B. Lodge is a store in downtown Albany, NY offering kids school uniforms as well as uniforms for adults. We have public and parochial school uniforms for both boys and girls. Adult sizes are also available if necessary. If you are looking for where to find school uniforms, B. Lodge & Company School Uniforms can help you today. We offer several different types uniforms and clothing services. Stop in today for your kids' school uniforms and for more information on all of the services that we offer. B. Lodge & Company has been in business since 1867. It’s the Capital District and Albany, NY’s largest supplier of school uniforms. Our school uniform shop is open Monday through Saturday from 9 a.m. to 5:25 p.m. Free parking is available daily with a $15 purchase. Phone and mail orders are welcomed for kids' school uniforms! Among others, B. Lodge carries school uniforms for Blessed Sacrament, St. Ambrose, and St. Ambrose Pre-School, St. Augustine's School, St. Mary's in Waterford Albany Leadership, All Saints, Brighter Choice School for Boys, Brighter Choice School for Girls, Holy Spirit, Green Tech High School, Henry Johnson Charter School, Latham Christian Academy, St. Pius X, and St. Jude the Apostle. Click HERE to see a price list for these schools. Wondering where to find school uniforms? Choose from a vast array of the best quality and inexpensive kids' school uniforms around. 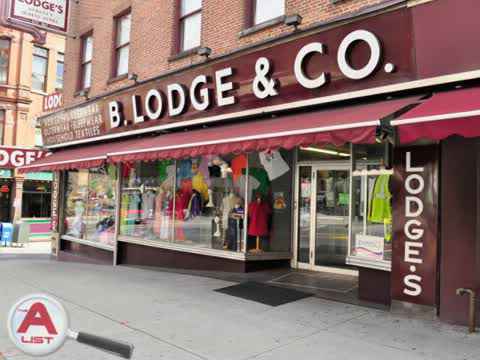 Parents and kids from in and around the Albany, NY area flock to B. Lodge’s school uniform sale every year to pick up inexpensive school uniforms and character backpacks at B. Lodge’s. Girls - find the right school uniform skirt at B. Lodge. Most school plaids are available. To accompany skirts and jumpers, girl’s parochial blouses come in white, blue, yellow, short or long sleeve. We also have tights and knee socks. If you need a boy's school uniform, B. Lodge’s has Oxford shirts and ties. Our school pants options include: double knee, regular, slim, husky, navy, black, green and khaki. Short-sleeve polo shirts and long-sleeve polo shirts come in sizes 4-20 and adult. We have 10 colors in stock. In-house embroidery is available. B. Lodge carries Elderwear, K>12 Gear and French Toast school uniforms. French Toast Official School Wear is the brand of choice for thousands of moms and schools at school uniform shops across America! Since 1958, French Toast has provided families with quality children’s wear and catholic school uniforms at great prices. You can count on French Toast to offer you the latest school uniforms, packed with great features like double knee reinforcements, adjustable collars and Wrinkle No More® fabrics, all at prices that can be less than half of what other uniform providers charge. Or for expandable waists, try K-12 Gear. Your child can easily be outfitted with easy-care, long lasting school uniforms for less than $100. Finish off your outfit with a pair of Boys or Girls Easy Stride school shoes. We have sizes 9 – 6 in black & brown. Along with kids school uniforms, we have shirts, ties and other items to match. Whether you need boy's school uniforms or girls school uniforms, come down to North Pearl St in Albany, NY, and check out our vast selection! Nobody beats our prices on kids' school uniforms! Tired of looking for where to find school uniforms? This year, remember B. Lodge & Company for all your kids school uniform needs! We are ready to serve you! School Uniforms, Uniforms, Albany School Uniforms, Private School Uniforms, Charter School Uniforms, Boys Uniforms, Girls Uniforms, School Clothes, Kids School Uniforms, Kids School Clothes.